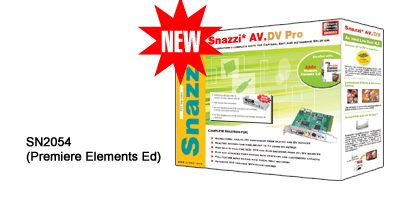 Presenting an unrivaled video capturing, editing and sharing solution, Snazzi* brings in AV.DV Pro, an ultimate head start for anyone who wants to explore the art of editing and movie making. It provides you everything you need to capture video from all your DV and analog devices, edit videos with customizable real-time and eye-catching effects, experience cinematic Dolby Digital, author professional DVDs with motion menus or output your movies for web, VHS and Microsoft Mobile Media Player, all at an unbelievable price. Comes bundled with industry acknowledged Premiere Elements 2.0, worth’s over $99 USD, it offers perfect combination of creative controls, incredible speed, reliability and maximum productivity in an easy and efficient platform. It's outstanding interface, sophisticated effects and keyframing controls even makes it easy for novice to be a director of his own movies and wow his audience anywhere.